Lacrimal gland - Infiltration cellular, Mononuclear cell in a male B6C3F1 mouse from a chronic study. Variably sized interstitial foci of mononuclear cells (mainly lymphocytes) (arrow) are present in the lacrimal gland. 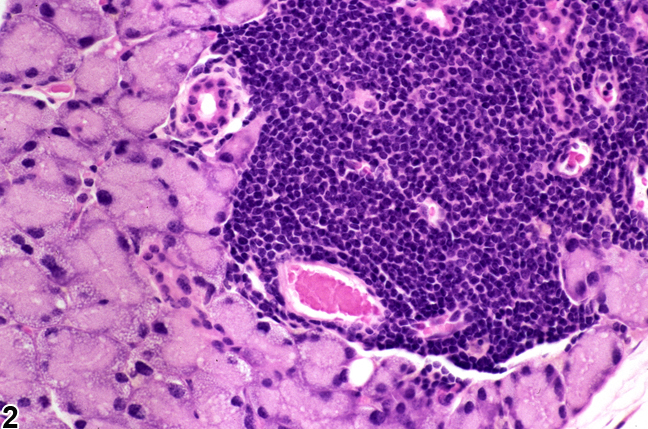 Lacrimal gland - Infiltration cellular, Mononuclear cell in a male B6C3F1 mouse from a chronic study (higher magnification of Figure 1). 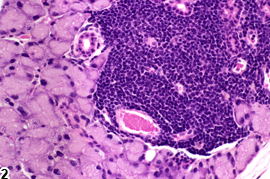 The mononuclear cells (mainly lymphocytes) are present without evidence of tissue damage. 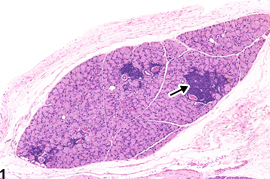 Scattered, variably sized interstitial foci of mononuclear cells (usually lymphocytes) are common in the lacrimal glands of rats and mice ( Figure 1 and Figure 2 ), often increasing in incidence and severity in older animals. Increased incidences and severity of such infiltrates can also occur as treatment-related toxic effects or in other pathologic conditions. Lacrimal gland mononuclear cell infiltrates should be diagnosed and assigned a severity grade only if there are treatment-related differences in the incidence and/or severity. Mononuclear cell infiltrates can be distinguished from inflammation by features of inflammation such as tissue destruction, hemorrhage, fibrosis, edema, and the presence of other leukocyte types. Botts S, Jokinen M, Gaillard ET, Elwell MR, Mann PC. 1999. Salivary, Harderian, and lacrimal glands. In: Pathology of the Mouse: Reference and Atlas (Maronpot RR, Boorman GA, Gaul BW, eds). Cache River Press, Vienna, IL, 49-79. Jiang G, Ke Y, Sun D, Li H, Ihnen M, Jumblatt MM, Foulks G, Wang Y, Bian Y, Kaplan HJ, Shao H. 2009. A new model of experimental autoimmune keratoconjunctivitis sicca (KCS) induced in Lewis rat by the autoantigen Klk1b22. Invest Ophthalmol Vis Sci 50:2245-–2254. Kojima T, Wakamatsu TS, Dogru M, Ogawa Y, Igarishi A, Ibrahim OMA, Inaba T, Shimizu T, Noda S, Obata H, Nakmura S, Wakmatsu A, Shirasawa T, Simazaki J, Negishi K, Tsubota K. 2012. Age-related dysfunction of the lacrimal gland and oxidative stress: Evidence from the Cu,Zn,-superoxide dismutase (Sod1) knockout mice. Am J Pathol 180:1879-1896. Krinke GJ, Schaetti PR, Krinke A. 1996. Nonneoplastic and neoplastic changes in the Harderian and lacrimal glands. In: Pathobiology of the Aging Mouse, Vol 2 (Mohr U, Dungworth DL, Capen CC, Carlton WW, Sundberg JP, Ward JM, eds). International Life Sciences Institute Press, Washington, DC, 139-152. Mikulowska-Mennis A, Xu B, Berberian JM, Michie SA. 2001. Lymphocyte migration to inflamed lacrimal glands is mediated by vascular cell adhesion molecule-1/ α4 β1 integrin, peripheral node addressin/l-selectin, and lymphocyte function-associated antigen-1 adhesion pathways. Am J Pathol 159:671–681. National Toxicology Program. 1990. NTP TR-386. Toxicology and Carcinogenesis Studies of Tetranitromethane (CAS No. 509-14-8) in F344/N Rats and B6C3F1 Mice (Inhalation Studies). NTP, Research Triangle Park, NC. Rahimy E, Pitcher JD III, Pangelinan SB, Chen W, Farley WJ, Niederkorn JY, Stern ME, Li DQ, Pflugfelder SC, De Paiva CS. 2010. Spontaneous autoimmune dacryoadenitis in aged CD25KO mice. Am J Pathol 177:744-753. Rios JD, Horikawa Y, Chan L-L, Kubin CL, Hodges RR, Dartt DA, Zoukhri D. 2005. Age-dependent alterations in mouse exorbital lacrimal gland structure, innervation and secretory response. Exp Eye Res 80:477-491. Wu K, Joffre C, Li X, MacVeigh-Aloni M, Hom M, Hwang J, Ding C, Gregoire S, Bretillon L, Zhong JF, Hamm-Alvarez SF. 2009. Altered expression of genes functioning in lipid homeostasis is associated with lipid deposition in NOD mouse lacrimal gland. Exp Eye Res 89:319-332.